RaySupreme is interesting 3D software due to its unique interface. You describe a scene in words and the program places the objects in the scene. There are a limited number of objects in the database and it's possible the current status of this feature is a gimmick or fun diversion, but if RaySupreme improves over time the potential for novices to easily create 3D scenes is interesting. At Siggraph 2012 MIT researchers are going to present their 3D display technology named High Rank 3D (HR3D). It's not stereo vision as it presents a changing perspective as the viewer's head moves. The trick is 3 LCD screens, limitations in the human visual system and a lot of processing power. The video embedded in this Extremetech article explains what HR3D is all about. According to VentureBeat MasterImage 3D's approach to glasses free 3D displays differs from that employed by current devices like the Nintendo 3DS. It uses a cell matrix parallax barrier promising no ghosting or cross talk and a smooth transition to a 2D image at wide viewing angles. A disadvantage of this technology is it requires the user to be positioned close to the screen so it's most suitable for handheld devices. For this reason MasterImage 3D is focusing on screens smaller than 10 inches in diameter. If you're interested in converting photographs to stereo 3D consider giving Gimpel3D a try. It's free for personal and commercial use. Here's a brief description from the web site. As reported previously Integral 3D technology is spatial which means it needs to increase resolution to add more viewpoints. Zecotek is demonstrating technology that uses a different approach. It time slices to present the viewer with a high resolution image that provides many viewpoints or perspectives. The prototype displays 100 perspectives in a 40 degree viewing angle. To accomplish this Zecotek uses DLP technology from TI that refreshes in the range of 2000 Hz. They are currently demonstrating the prototype for potential licensees and OEMs. There is a 5 minute long Discovery Channel video demonstrating Zecotek's technology. MachStudio Pro utilizes GPUs to enhance its rendering performance and it's now available for free with no strings attached. The company plans to make money via support, training, and services. New Scientist reports on a new hologram technology that utilizes a quantum effect to display the same color at all angles. Zebra Imaging is back in the news thanks to research sponsored by DARPA, only this time they're talking about a holographic table rather than static prints. Here's a snippet from the press release. Many of today’s conflicts occur in urban settings, making the ability to visualize conditions in urban areas increasingly important to commanders and mission planners. The Defense Advanced Research Projects Agency (DARPA) recently completed a five-year program called Urban Photonic Sandtable Display (UPSD) that creates a real-time, color, 360-degree 3D holographic display to assist battle planners. This is twist on glasses free 3D display technology that we haven't reported on previously. Video is captured through 100,000 lenses to provide slightly different viewpoints. An identical lens array is used for playback. In terms of the image characteristics, there is a trade-off in the system in which an increase in the viewing angle results in a decrease in the image resolution. To maximize both characteristics, the researchers explain that it is necessary to shorten the distance between the lens array and the display device, and also narrow the pitch of the lenses, which requires a large number of pixels. Overall, the system uses a total of 7,680 pixels in the horizontal direction and 4,320 pixels in the vertical direction. With these adjustments, the researchers could ensure a viewing angle of 24 degrees and a spatial frequency that is 2.4 times higher than that of their previous system. Next Big Future links to a YouTube video that does a great job explaining the basics of the technology. IEEE Spectrum covers non-stereoscopic display technologies that were shown at CES 2011. InnoVision presented their reflection based HoloAD display and Aerial 3D's display creates laser-induced plasma to create a direct view image. Quoting Engadget, "The monitor uses a directional backlight and a time lag to effectively hit each eye individually through the same pixel." This means the DuraVision LCD will support a higher resolution than a lenticular based display, but it will likely still require the viewer to stay in a sweet spot to clearly see the 3D effect. We've mention Zebra Imaging before, but Engadget has some videos showing off their holograms. The holograms can be created from a variety of data sources including AutoCAD. Some of you may have heard of Moritz von Rohr and his Synopter, but I had not. It will be interesting to see if this is successful. In 1907 a Polish optical scientist named Moritz von Rohr unveiled a strange device named the Synopter, which he claimed could make two-dimensional images appear 3D. By looking through the arrangement of lenses and mirrors, visitors to art galleries would be drawn into the paintings, as if the framed canvas had become a window to a world beyond. But the Synopter – heavy and prohibitively expensive – was a commercial failure, and the device vanished almost without trace. A century later, Rob Black is hoping to rekindle interest in von Rohr's creation. A psychologist specialising in visual perception at the University of Liverpool, UK, Black has designed and built an improved version he calls "The I". Unlike some 3D glasses, the device uses no electronics, and works on normal 2D images or video. There are a lot of recent articles on the web about fast updating hologram research at the University of Arizona. Here are three with more depth than much of the coverage. IEEE Spectrum, New Scientist, Technology Review. A New Scientist article discusses some state of the art technologies being employed for glasses free 3D displays. The most interesting approach might be that of Helium3D. They use eye tracking and laser projection to create the proper image for each eye. The projects web site claims support for multiple users, but doesn't define the number of users. Helium3D is apparently a consortium project and there's no word on a product ship date so there will likely be a long wait. Autodesk Inc. announces the availability of Project Photofly, a technology preview of a Web service that allows users to easily create 3D models from photographs using the cloud. Project Photofly is currently available for free on Autodesk Labs. At Siggraph 2010 Sony showed off a neat prototype display that projects 360 images in a cylinder such that the viewer can walk around the display. Having one image per degree limits the resolution of the display, but the video still looks impressive. This new pico projector based 3D scanner from 4D Dynamics has to be the coolest looking scanner I've seen. It looks like a Star Wars battle droid and costs $1999 via Amazon. Here's what 3D-Display-Info says about it. 4D Dynamics has released a new pico-projector based consumer 3D scanner called PicoScan. The scanner is a Canon 1000D DSLR bundled with a pico-projector and 3D scanning software (based on the Mephisto scan engine). The idea is that you can take photos around an object and the software turns it into a 3D model. The projector is used for radiometric calibration. Beyond - A Collapsible Input Device. Here's a clever interface from the MIT Media Lab. It allows a user to draw in three dimensional space using pressure to define depth. Live visual feedback lets the user see what's being drawn. Gizmodo's article contains a video showing how Beyond works. Agisoft has released a pair of new image based modeling applications that are fully automatic and well suited for arbitrary geometry reconstruction. PhotoScan is the program professionals and enthusiasts will want as takes in multiple images as input, aligns them, and outputs a 3D model in one of many formats. StereoScan is free and creates a model from two images. It's meant to be used with a camera like the FujiFilm Real 3D W1. MaximumPC published a how to article for converting 2D movies to 3D. The quality is not going to match that of a true 3D movie, but if you have a 3D setup at home this might be a fun to play around with. Wiggle Stereoscopy is a neat way to create auto-stereoscopic images without any special hardware. Apparently it's not a new technique, but it's new to me and Lifehacker. The effect is very convincing in the provided sample image. 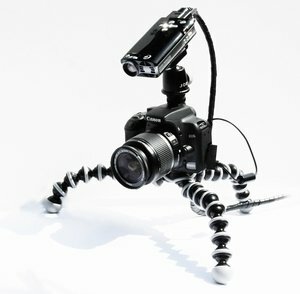 Fujifilm has released more details on their consumer 3D camera due out in September 2009. It's a point and shoot camera with an integrated autostereoscopic LCD display. I4U has more details and Stuff already has a review. Apparently Philips is pulling the plug on their 3D television products and the 3D Solutions division. Among the display of new camera models at PMA 2009 FUJIFILM demonstrated a compelling 3D photo and movie technology, that uses a dual lens/sensor camera to record 3D images. These images can then be played back without the need for special glasses on a digital display, or even printed. Both the display and prints generate their 3D effect by use of a special lenticular lens laminated to their surfaces. A 3D Curve Sketching System For Tablets was posted on Slashdot months ago so it's not exactly breaking news, but many readers might have missed it. The videos are a great way to get a feel for the software's capability. This research project from the Dynamic Graphics Project of the University of Toronto is called ILoveSketch and a paper is available in addition to the videos. Unfortunately it doesn't look like you can download the software. While there are a number of software applications that create 3D models from digital photographs a new player is changing things up a bit by creating an internet service. Scanetica doesn't require any special equipment or software and for now at least it's free to use. The service can handle a wide range of subject sizes from satellite imagery to tiny fossils. Currently there's no automated way to stitch models together to create a seamless 360 degree view, but this feature is in development. We've previously posted about the free David software that turns a collection of inexpensive parts into a homebrew laser scanner. Today TechRadar has published a tutorial for getting everything up and running so if you need to create 3D models and haven't tried this yet it's worth another look. I missed posting this before the Holidays, but it's not too late to check it out. Snowdin is a Winter theme'd site with a twist. The Flash animations and games are in 3D. If you have red/blue anaglyph glasses you and your kids will enjoy some 3D scenery and simple games. One game resembles Qbert. 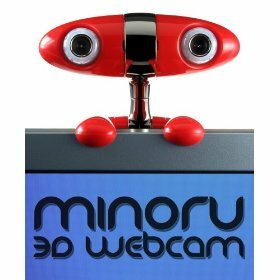 Continuing with the red/blue glasses theme we have the Minoru 3D Webcam. The Webcam has 2 cameras and when combined with red/blue glasses you can use it to talk to your friends and family in 3D. IEEE Spectrum has a video from CES 2009 and it's available for purchase at Amazon . Xbit Laboratories has a review of Zalman's Trimon ZM-M220W Stereo Monitor. It uses polarized glasses to achieve the stereo affect. If you're thinking about purchasing such a monitor check out the review. In June and July 2008 Computer Graphics World published an interesting two part series on Holograms. Part one focuses on the technology and companies behind 'Digital Holograms' and part two covers how artists are using these cutting edge technologies to create 'Dimensional Art'. Read about cutting-edge 3-D computer graphics methods, techniques, hardware, and software. Articles cover 3-D cameras, autostereoscopic displays for entertainment and visualization, and 3-D modeling. 3dcgi.com has joined the Amazon.com affiliate program in an effort to make it easy for our visitors to learn more about 3-D computer graphics and the technologies mentioned on this site. So if you see a book that interests you click on the link to Amazon's site to read reviews and/or make a purchase. To see some of these books now go to the Learn About 3D page. 3dcgi.com distributes a low volume newsetter. The newsletter is never sent more than once a month and is usually less frequent than monthly.